The cloud provides efficient ways of running technology. As a cloud service provider, we focus on pricing innovation with the goal of helping you save more. This gives you more cloud for less cost, while maintaining simplicity and flexibility. Receive a discount on your Azure services by purchasing reservations. Giving us visibility into your one-year or three-year resource needs in advance allows us to be more efficient. In return, we pass these savings on to you as discounts of up to 72 per cent1. Reduce your costs by up to 72 per cent compared to Pay-As-You-Go subscriptions for selected Azure services. Save up to 80 per cent2 when you combine reservation savings with Azure Hybrid Benefit. Reserve resources up front to help plan for long-term success. Take advantage of one-year or three-year terms and pay up front to support your budget goals. Purchase reservations in a few simple steps, directly from the Azure portal. Exchange reservations easily as your workload or application needs change. Cancel at any time and return the remaining months of a reservation for a termination fee. Combine Windows and Linux reserved VM instances savings with Pay-As-You-Go pricing to manage costs across predictable and variable workloads. Reduce your spend by prepaying for fully managed Azure data services. 1 The 72% saving is based on one M32ts Azure VM for Windows OS in US Gov Virginia region running for 36 months at a Pay as You Go rate of ~$3660.81/month; reduced rate for a 3-year Reserved Instance of ~$663.45/month. Azure pricing as of 30/10/2018 (prices subject to change). Actual savings may vary based on location, instance type or usage. 2The 80% saving is based on the combined cost of Azure Hybrid Benefit for Windows Server and 3-year Azure Reserved Instance. The estimate does not include Software Assurance costs. Sample annual cost comparison of two D2V3 Windows Server VMs. Savings based on two D2V3 VMs in US West 2 Region running 744 hours/month for 12 months; Base compute rate at SUSE Linux Enterprise rate for US West 2. Azure pricing as of 04/24/2018. Prices subject to change. Actual savings may vary based on location, instance type or usage. 3 Savings calculations based on one M32ts Azure VM for CentOS or Ubuntu Linux in US Gov Virginia region running for 36 months at a Pay-as-you-go rate of ~$2371.04/month; reduced rate for a 3-year Reserved Instance of ~$663.45/month. Azure pricing as of 07/11/2018  (prices subject to change). Actual savings may vary based on location, instance type or usage. 4The 80% savings based on eight vCore SQL Database Business Critical in West 2 US Region, running 730 hours per month. 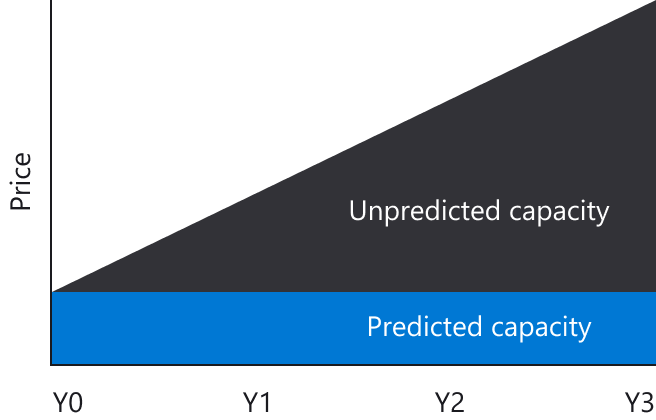 Savings are calculated from on-demand full price (licence included) against base rate with Azure Hybrid Benefit plus 3-year reserved capacity commitment. Savings excludes Software Assurance cost for SQL Server Enterprise edition, which may vary based on EA agreement. Actual savings may vary based on region, instance size and performance tier. Prices as of November 2018, subject to change. 5Savings available on one-year or three-year Azure Cosmos DB reserved capacity terms vs Pay-As-You-Go prices. Actual savings may vary based on total provisioned Throughput (RU/s), single-region or multiple-region writes and term length. Prices as of November 2018, and subject to change.